Wood floors are a beautiful addition to any room. Deep rich textures and colors add real appeal to your home and make the inevitable spill easier to clean up compared to carpeted areas. However, wood floors can be quite an investment and can show a lot of wear and tear from through traffic. Chem-Dry of Acadiana has worked to provide a specialized wood floor cleaning service in Lafayette to revitalize the life of your wood flooring and help it remain durable and long lasting. Not only do we work hard to provide services that will keep your home healthy but that will provide noticeable lasting results. As compared to DIY mopping, read about the four characteristics that set our wood floor cleaning service apart from at-home methods. Our wood floor cleaning service removes dirt, grime, allergens, and bacteria from deep in the grain of your floors. 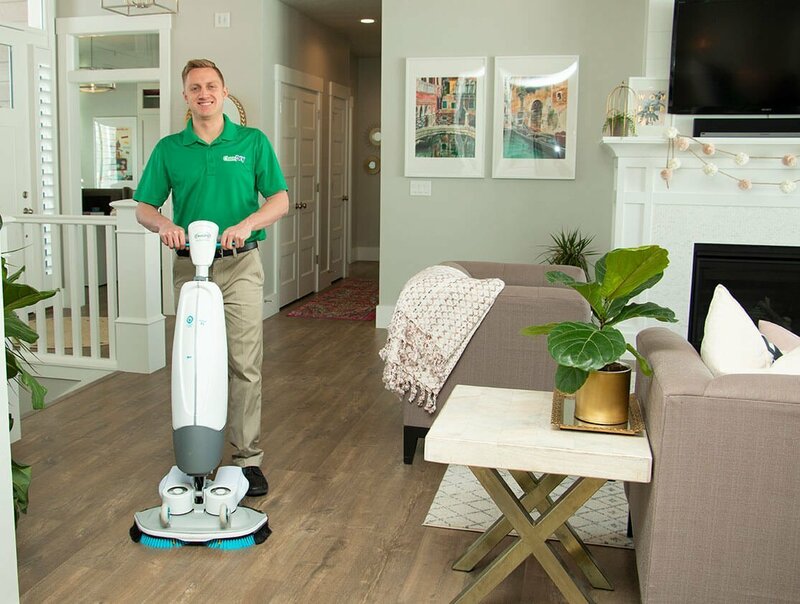 Rather than soaking your floors with water like you would with traditional mopping, we use minimal water and a powerful vacuum to extract leftover moisture, dirt and contaminants. Our Green-Certified Solution works to sanitize floors while still being non-toxic and safe for children and pets. Our professional grade cleaning solution eliminates bacteria from deep in the wood grain to the surface of the floor leaving your home healthier and cleaner. Our wood floor cleaning in Lafayette provides a protective barrier and increases the life of your floors. Plus our industry-leading machine uses counter-rotating brushes to penetrate the wood grain without causing any harm to the surface of your floors for long-lasting results. After ensuring your floors are cleaned from the inside out we will polish them off with our signature wood floor polisher. Our long-lasting polish leaves a protective barrier between your floors and feet and a beautiful shine that make them look like new. What’s in the Grain of Your Wood Floor? You may have never considered what might be hiding in your wood floors. The small granular openings in the wood are the perfect hiding place for dirt, grime, allergens and bacteria. Our wood floor cleaning solution works to eliminate unwanted particles at the source and in turn leaves your floors looking like new. We know wood floors are a major investment in your home so we only send the most trained and knowledgable technicians to your home to assess the damage to your floors, walk you step by step through our process and leave you with results you and your family will love. 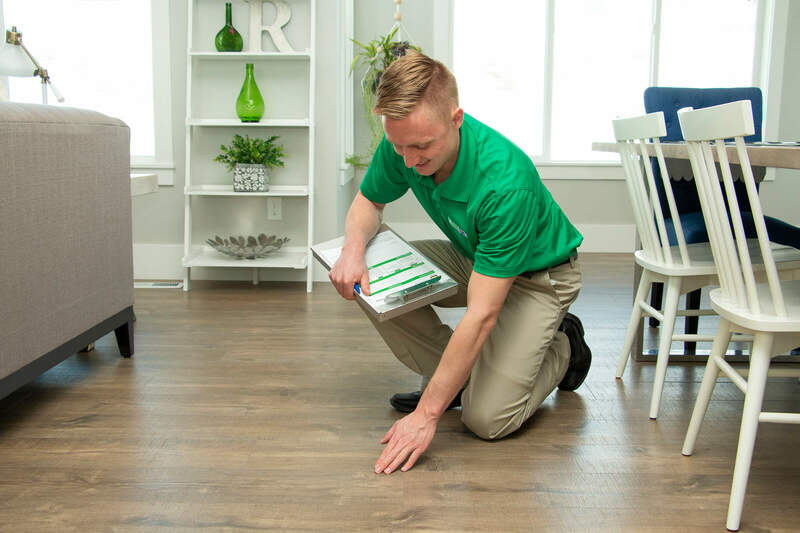 Our certified technician will inspect the condition of your floor, including scratches and blemishes. Our process is not recommended for floors with deep scratches, blemishes discoloration, staining or bare wood floors. We will then determine if the floor as an acrylic coating in order to remove any polishing or coating before cleaning so that we can extract dirt form deep in the flooring. 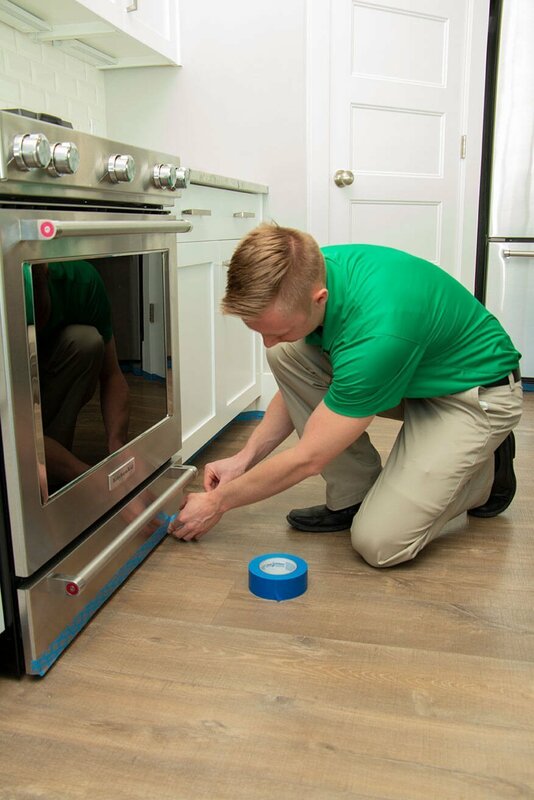 A technician will tape off the surrounding area so as not to ruin appliances or cabinetry. They will then begin the process of cleaning the wood floors with our specially formulated, green-certified cleaner. This will remove dirt, debris, and contaminants leaving your floors healthier and streak-free. A sanitizer can be applied to eliminate further bacteria on the surface and in the wood grain as well. Once the floor has been cleaned and sanitized, a polish is then applied. Our polish provides a beautiful shine and a protective layer to prevent future damage to the surface of the floor. Why Have Chem-Dry of Acadiana Clean Your Wood Floors?